Bread and cheese have to be two of the greatest inventions ever. And the Earl of Sandwich must get karmic brownie points for turning a vice into a blessing: legend has it that he invented the sandwich so that he could eat and continue to play cards uninterrupted. Things have been crazily busy at the Imperial Palace, also known as Chez Chow, as we get ready to leave town on a business trip, yet again. I had to take the pups to cage-free boarding, and that’s hard on all of us, even though they have a good time there. Gus is partial to blondes, and virtually every young lady who works at the place is a blonde babe. Both he and Daisy just love to be cuddled, and they get a lot of that there. So, what does this all have to do with food? In a nutshell, I’ve been so busy that I had to take a deep breath and force myself to eat something decent, something besides ramen noodles. 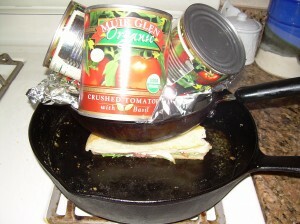 Lately I’ve been making paninis, but this time I was too darned worn out to go dig out my grill, so I just made it the old fashioned way, as you can see from the picture below. 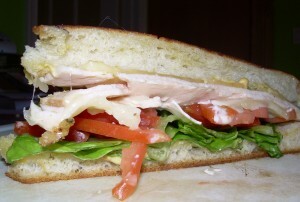 So, what do you get when you take crusty focaccia, and stuff it with dill havarti, lettuce, tomatoes, Dijon mustard, and some chicken? And then you brush the whole thing with extra virgin olive oil and grill it in your trusty and faithful cast iron skillet? Heaven. Thank you, Earl of Sandwich, thank you. And if you’d like to see some fantastic bread creations by food bloggers, be sure to check out Susan’s Yeastspotting roundup every Friday! Madam, you’ve nailed it . . . or should that be you’ve canned it 😉 whatever a grilled panini is a very wonderous thing indeed! I absolutely love your homemade panini grill. Necessity is the mother of invention, right? Will I be ostracized if I admit I’ve never made a panini? Except grilled cheese, but that started before anyone knew the word “panini.” This looks great and I’m really going to have to do it. There is nothing better than grilled cheese. I’ve made many a panini using your method. It works!